I’m a perfectionist. I’d be set if I applied this trait to something useful, like school work, but that isn’t always the case. Instead, I put it into my costuming. It’s fun to find replicas for Alice’s clothes, but I rarely wear them myself — unless they’re a REALLY close match — because I’m too detail-oriented not to want the real thing. Because of this, I went in search of the perfect topaz contacts. And for a while, I thought I’d found them. Well, you don’t have to tell me twice. So I put in the order, wept a little as I gave my credit card number, and waited. I had a convention to go to in May, and I was going to be dressed in three different Alice costumes for the weekend. I thought these contacts would perfect them. So I waited anxiously for my contacts to arrive, and when they did… the horror. THE HORROR. Avert your eyes if you’re sensitive to scary images, ladies. …So, yeah. Ignore the wonkiness of my eyes; my head was tilted and I was squinting into the light. By this point, though, you’ve probably noticed that the contacts I received looked NOTHING like the sample photo provided. 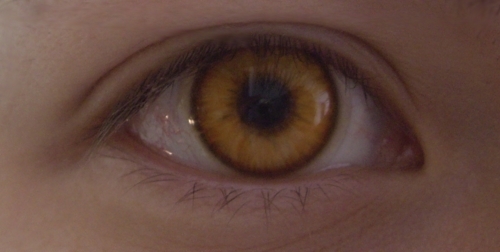 They were orange and red in colour, without the black limbal ring the ones I ordered had. And let me tell you: I was absolutely FURIOUS. I’d just paid $300! Why should my contacts be anything less than perfect? And more importantly, why would the lens makers present one image on their website and expect a customer to be happy when they received something entirely different? So I e-mailed the company. And called them. And e-mailed them again. They agreed to take the lenses back for repainting, but I had to pay to have them shipped back. Ugh. Fine. I was annoyed by this, but I didn’t think there was much I could do. From a customer service standpoint, I was upset that they would ask me to further pay for THEIR mistake, but that’s neither here nor there. So I sent the contacts back for repainting. A hasty job was done on them, and they arrived back in my hands the very day of my convention. I still wasn’t happy with them. You could still see red threaded through the new golden brown colour, and overall, they just weren’t dramatic enough. I felt like they looked too natural for what they were supposed to represent: the eyes of VAMPIRES! Although they try to blend in, nothing is meant to be subtle about the way the Cullens look. I bregrudgingly wore the contacts for the convention, then sent them back for further repainting. When I got them back for a second time, they were improved — the ring around the edges was finally black, and the colour was more golden — but I still wasn’t happy. The colours were almost muddy, not vibrant. Still, I didn’t want to spend any more money, so I dropped the issue. I’m not even going to bother posting a photo of the finished product. They’re THAT unremarkable, especially in photos, where they can barely be seen. Fast forward through a pre-Eclipse event, the midnight screening of Eclipse, and Toronto’s Twilight convention in July. I wore the lenses to all three, and they were fine (or as fine as they could be). As you can imagine, I took incredibly good care of them and was EXTREMELY careful when I handled them. The thought of losing or destroying one, after what I’d stupidly paid for them, was outright scary. Then came Fan Expo at the end of August. I went to put my contacts in when I noticed something that caused me to panic immediately: one of my contacts was ripped. Just like that, it was ripped. I couldn’t wear them again — they’d scratch the hell out of my eye. All that money, just… gone. Wasted on contacts that were ruined within four months, after being worn only a handful of times. On FX Eyes’ FAQ page, they state that while they will repaint inaccurate lenses, they will do absolutely nothing for ripped lenses. The fact that they stated this upfront leads me to believe that this is an issue that many of their customers have had. Still, I contacted them anyway. I’ve worked in customer service, and I’ve personally done anything I can to appease an unsatisfied customer. I hoped they’d do the same for me, especially since I’d already been through such a hassle to get my contacts to even RESEMBLE their sample image. Was that the case? Of course not. I’ll be honest with you: I had visions of receiving new contacts for free, or at least a hefty discount on a new pair, like, say… in the range of 50%. Unrealistic? Probably. But a girl can dream. I spoke directly to the owner of the company, who told me point blank that there was “nothing they could do” for me. Are you kidding me? You’re the owner of the company. There’s ALWAYS something you can do, ESPECIALLY if you’re the owner. And maybe, if he HAD done something, I wouldn’t be sitting here writing this right now. I pressed the issue, asking him if I could at least have a discount on a new set of lenses. He offered me 10%. But what is 10% to me when I don’t even trust them to give me a) reliable service, and b) the product as ADVERTISED? So, needless to say, I passed on his “offer.” And I’ve been looking elsewhere ever since. FX Eyes makes special effects lenses, but in my experience, the only “special” thing about them was their ability to gauge my bank account. In this case, more expensive was definitely NOT better. I wouldn’t recommend these to ANYONE anymore. I had a hard time finding colored contacts that worked for me…I still can’t find the perfect pair. It really stinks being broke, and also having to get prescription ones. don’t worry, i’ve got some suggestions in part II that are in all price ranges. 🙂 which ones have you tried? Ugh, not only these contacts were ugly, but they could have hurt your eyes pretty badly! exactly. if they looked the way they were supposed to, i wouldn’t care (yes i would, but i’d care LESS) about the price. i mean, they’re hand painted and high quality, meant to cover any colour of eye. but i definitely didn’t order ORANGE contacts! Previous Want a subscriber contest? I’ve seen it in your future!